ALLISON LOVEJOY is a classical pianist, keyboardist, composer, cabaret singer, accordionist, educator and producer of musical events. Allison Lovejoy is an extraordinarily exciting and versatile pianist. Specializing in early 20th century repertoire, she also plays the music of the masters with insight and passion. She began studying piano at age 5, and has been in demand as soloist and collaborator throughout her conservatory and professional careers. Allison Lovejoy has performed internationally as a soloist, chamber musician, and accompanist. Her insightful and passionate performances have received wide acclaim, and her varied repertoire highlights virtuoso works of the late 19th and early 20th century. She has performed the Beethoven “Emperor” Concerto with the Orchestra of the International Festival of Music in Nicaragua under the baton of Maestro Urs Leonhart Steiner, and has also appeared as soloist in Rachmaninov’s “Rhapsody on a Theme of Paganini”, Gershwin’s “Rhapsody in Blue” and the Prokofiev Concerto No. 3. She was a prizewinner in the San Jose Young Artist and the San Francisco Concerto Orchestra Competitions, as well as a recipient of a Shenson Concert Series Grant. A guest speaker and performer at the 1998 San Francisco Symphony all-Gershwin concert at Stern Grove, she regularly presents concert-talks throughout California. Miss Lovejoy received her M.M. from the San Francisco Conservatory of Music, her B.M. from the University of the Pacific and the Royal Academy of Music in London. Her teachers include Robert Helps, Daniell Revenaugh, Mack McCray, Nathan Schwartz and Gyorgy Sandor. She was also a participant in the Holland International Music Sessions for young artists, where she participated in master classes with John O’Conor and Marie-Francois Bucquet. She has recorded a CD of solo works by Rachmaninov, Ravel, Debusssy and Bartok on Metro Records, and her album “Nocturnes for Piano” includes rare and popular gems by Chopin, Faure, Satie, Poulenc, Barber and others. 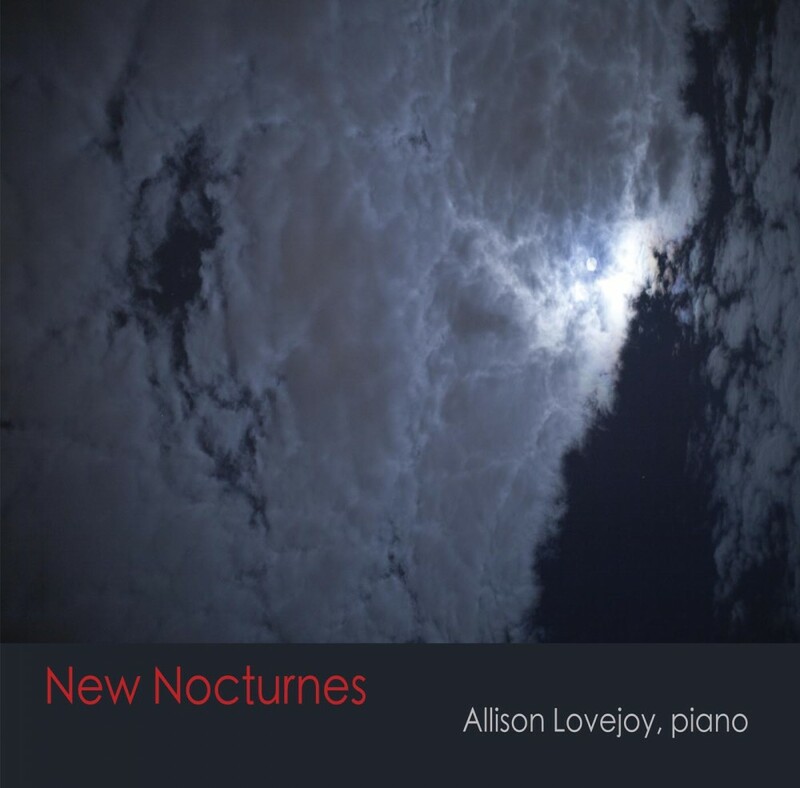 New works by composers William Bolcom, Kirke Mechem, George Rubissow, Ted Wiprud, Marcus Shelby, Rob Reich and Chus Alonso have been commissioned or selected by Miss Lovejoy for “New Nocturnes for Piano“, which will be released in 2012. As a chamber musician, Allison presents concerts in collaboration with notable cellist Emil Miland, violinist Karsten Windt, trumpeter Dave Scott and vocalists Indre Viskontas and Zoltan DiBartolo. Early show with jazz and more!Please come support the New Nocturnes for Piano Kickstarter – we are half way to our goal and need your help to reach it by January 10!Music by:The one and only Mr. Lucky with Michael Groh on guitar! !Fabulous vocalist Karina Denike and Michael Mccintosh on piano! !Diana Strong, accordion and the amazing Anna Ishida, vocals (singing some original Allison Lovejoy songs/arrangements)Allison Lovejoy playing some original music.and other special guests! !Films by Nara Denning! Silent Auction with prizes music lessons, artwork by David Baillon, Mr. Lucky, and CDs! This entry was posted in Amnesia, Classical, Community Music Center, songbird festival presents, Songbird Presents, Songbird Winter Festival, Uncategorized and tagged Allison Lovejoy, Amnesia, Diana Strong, Kickstarter, Mad Shrew, Mr. Lucky, Nara Denning, New Nocturnes, new Nocturnes for Piano, Nocturne's, San Francisco. Bookmark the permalink.